Cilantro is the fresh leaves of the coriander plant. Native to southern Europe and the Mediterranean region, this herb quickly made its way around the world for both its culinary and medicinal benefits. 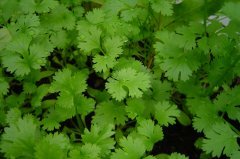 Cilantro pairs well with Thai, East Indian, Chinese, and Mexican cuisines. Cut the ends off the bunch of cilantro and store upright in a glass with a small amount of water. Covered loosely with a plastic bag and stored in the refrigerator, cilantro will last for several days.